Columbia, MD – March 1, 2016 – SolarWindow Technologies, Inc. (OTCQB: WNDW), the leading developer of first-of-its-kind transparent electricity-generating coatings for glass and flexible plastics, today announced that it has entered into Phase III of its Cooperative Research and Development Agreement (CRADA) with the U.S. Department of Energy’s National Renewable Energy Laboratory (NREL). The primary development goal of the Agreement is the commercialization of SolarWindow™ products. SolarWindow Principal Scientist Dr. Scott Hammond (left) with NREL scientist Dr. Scott Mauger, applying electricity-generating coatings to glass at the NREL lab. 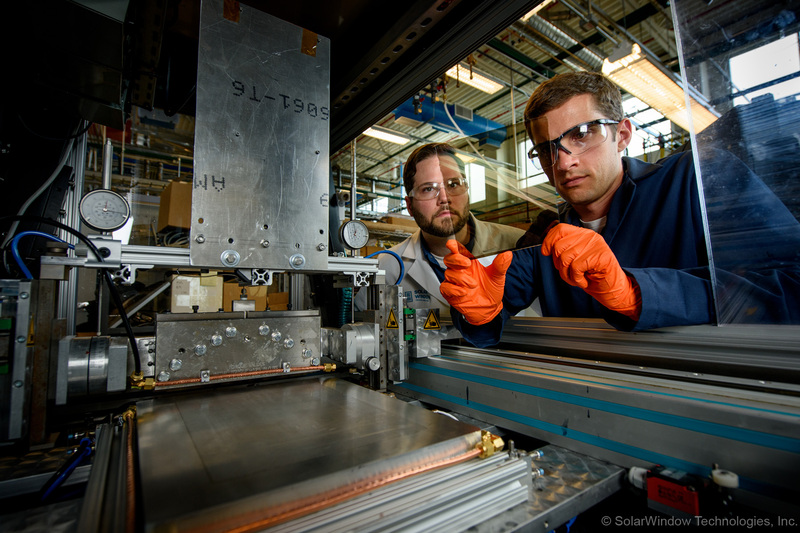 NREL is recognized as one of the most respected and advanced solar-photovoltaic research institutions in the world. NREL scientists have been working side-by-side with SolarWindow Principal Scientist, Dr. Scott R. Hammond during the development of SolarWindow transparent electricity-generating coatings. SolarWindow is initially targeting the five million tall towers and commercial buildings in the United States, which consume almost 40% of the electrical energy generated. Under the terms of the Agreement, SolarWindow and NREL will continue to work jointly to enhance product performance, increase scale, and improve reliability; and develop new features and obtain important performance certifications required for a commercial rollout. SolarWindow™ can provide a one-year financial payback while producing 50-times greater energy than rooftop solar when modeled for a 50-story building, according to the company’s independent validation. For the same building, SolarWindow shows 15-times the environmental benefit of rooftop solar by avoiding 2.2 million miles of equivalent carbon dioxide emissions produced by vehicles, according to the company’s independently validated Power & Financial Model.